It’s very easy to fall into a rut over the long, dark, cold winter months. Snuggling up on the couch and staying indoors become the norm as we eagerly wait for warmer days to help us shake things up. But spring is coming, my friends! So as we begin the steady march out of winter and into the longer, brighter days, now is a fabulous time to refresh our workouts! One of the areas I see many people getting bored with is core workouts. Often, people find something that works well (initially) or that they like and then they stick to it, repeating the same moves over and over. But your core needs challenge and change to continue getting stronger. Without variation, even the most effective workout begins to lose its effectiveness over time. So out with the old and in with the new! Try these 4 moves to re-energize your core and get those muscles working in a totally new way. 1. Pass the Block: Hold a block (or a small ball or pillow) between your ankles and lie down on the ground with your arms reaching out long beside your ears. Simultaneously, lift your legs up to the ceiling and crunch up through your upper body so that you can grab the block and return to lying on the floor with the block in your hands. Repeat the crunch, passing the block back from your hands to your feet. This is 1 complete cycle. Complete 2-3 sets of 5 full cycles. 2. Side Plank Kick Outs: Begin in a Downward Facing Dog position— an inverted V— as shown. Come up onto your tiptoes and shift your weight forward toward your hands as you round your upper back and pull your navel in toward your spine. Lift your left leg and cross your left ankle over your right leg at your knee. 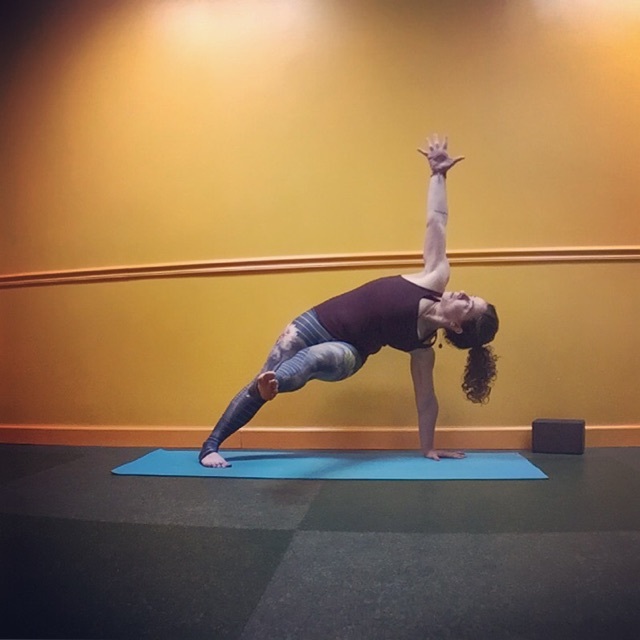 Then, lift your right hand and reach up to the ceiling as you slowly extend your left leg out to the right— or instead of kicking your left leg out, just open up to the side plank on your right leg, keeping your left leg lifted but close to your body. Return to the start position and repeat on the other side. Complete 2-3 sets of 8 reps (4 reps per side). 3. Cycling: Lie on your back, palms face down on the floor beside your hips. Press your low back into the ground to engage your core. Lift your head, neck, and shoulders off the floor slightly— but be sure to keep the back of your neck long. Pull your right knee into your chest and lift your left leg off the ground: closer to the floor is harder. Inhale, switch your legs. Exhale, switch again. Keep switching legs with your breath, gradually picking up the pace. 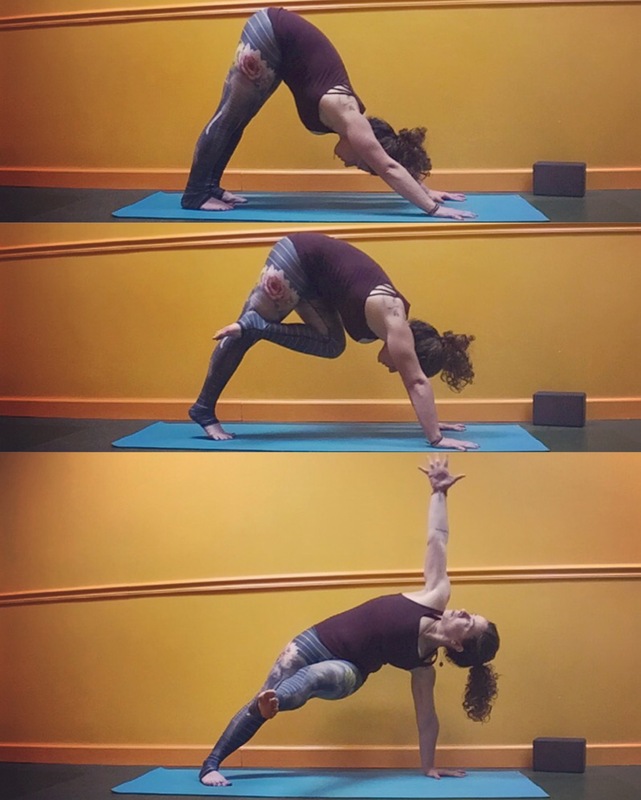 Focus on keeping your navel pulled in toward your spine and low back pressed firmly into the ground. Complete 2-3 sets of 20 reps (10 reps per side). 4. 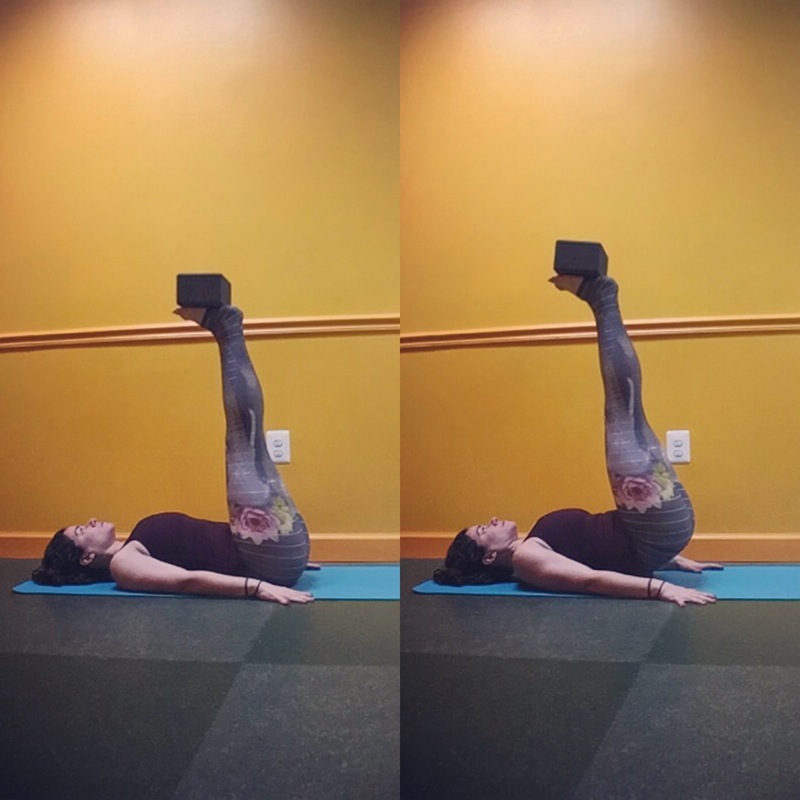 Hip Ups: Lie on your back with your legs extended toward the ceiling, feet flexed so your heels point up. Place a block (or pillow or small book) on your feet. 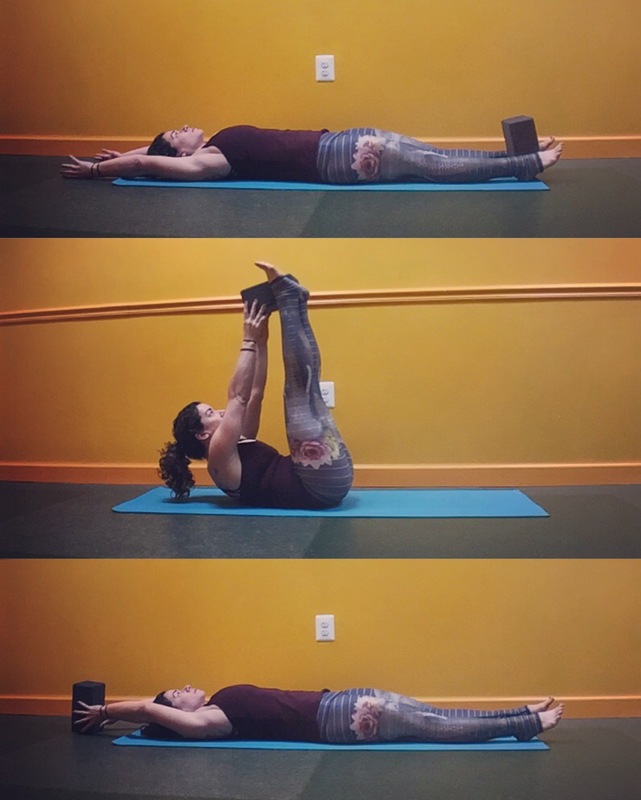 With your palms down on the floor beside you, use your lower abs to press the block straight up to the ceiling in a slow controlled manner, lifting your hips up off the floor 1-3 inches. Slowly lower your hips to the floor. Complete 2-3 sets of 10 reps.